We will not keep a large number of dogs living with us. kennel situation. That is why we have a foster dog program. enough we can decide which of our girls meets our very strict criteria for our breeding program. This is how we have achieved such success in producing the dogs we have today! the age of 2 years, we will pay for your family members health testing. of age) she will be spayed at our cost and you will then get full ownership of the dog- for free! Standard Poodles can live up to 15 years of age. girls who retire from our breeding program but that is just not a healthy for us or them!!! a car or allowed to escape and get lost. Families must be located with a reasonable drive to the Fraser Valley in BC Canada. They must have some previous dog experience. Must feed a quality dog food approved by Paris Poodles. approaches strangers with confidence and in a socially acceptable manner. Will keep unaltered dogs away from the puppy/dog. Agrees to return the dog to Paris Poodles for whelping, and for breeding. of illness will inform Paris Poodles if the dog gets sick or injured. will be sexually altered by the vet of Paris Poodles' choosing at Paris Poodles' cost. strictly as an outside kennel dog. Give accurate progress reports of the dogs health & development. We will do a home check and ask many questions about the care our girl is going to receive. and has been sexually altered this is possible. good food, etc etc etc. 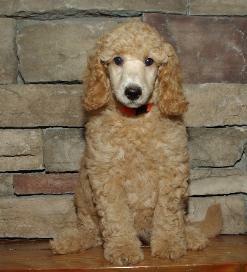 You get the best dog Paris Poodles has to offer. You will be living with our 'pick of the litter'. hopefully the one who is most beautiful. You get a fully health tested dog, and you don't have to pay for the test yourself! trained, leash trained, training started with Sit, Down, Stay, Come already well underway! "Board N Train" and your pup will get a month of this free! except they only go into heat every 6-9 months. dog who 'jumps the fence' - If this were to happen, we would take the girl back to our home! ones who benefit the most from this experience. enforce the contract should the need arise. The purpose of the foster arrangement is so the foster dog has the very best life has to offer! follow the contract can cause undue stress on everyone involved... Most importantly the dog! place to mold her into a good doggy citizen? If you are only looking for a short term commitment Paris Poodles Foster program isn't for you. your local humane society or animal shelter and volunteer! families so they tell you about their experiences with fostering for us. If you are interested please contact us for more information! know potential families and we usually form good friendships with our foster families!